Join us for second summer building tour of 2018 as we explore this year’s theme of infrastructure with a visit to Finch West Station! Finch West Station is one of six new subway stations on the $2.6 billion extension of the Spadina subway line from Toronto into the City of Vaughan. The station’s design includes an electrical substation raised above the bus terminal, a bus terminal, main entrance, ventilation shafts, a 360 vehicle commuter parking lot, passenger drop-off / pick-up and a bicycle parking storage facility. One of the key design principles of Finch West Station is to integrate architecture, engineering and art. IBI Group, LEA Consulting and WSP (TSGA Joint Venture) in collaboration with Will Alsop and artist Bruce McLean, were challenged to create a station design that acted as a catalyst to a new exciting public realm. 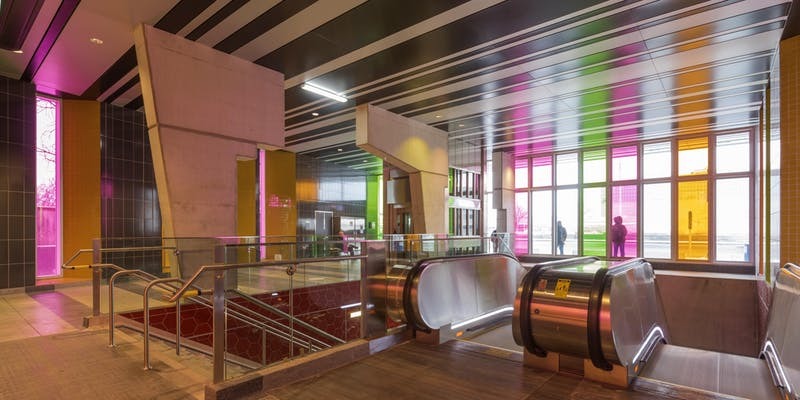 The various grade building components (bus terminal, transformer yard and main subway entrance) were developed to create colourful, transparent pedestrian entrances topped with stripped volumes supported on a collection of sculpted columns. These columns continue down to the platform level, linking this stop to the street in a two-storey, full height space adding to the drama of the interior public experience. The bus terminal continues these visceral effects outside onto the waiting areas with overlapping, sculpted canopies that wrap the raised substation. Responding to the dynamics of transit user movements and traffic, the canopies, terminals, entrances and supporting facilities are designed to work in concert, engaging the public life of the neighbourhood. The resulting concept blurs the purviews of the disciplines, yielding a concept that is both functional and visually exciting. Mohammad Majdabadi, Vice President of LEA Consulting Ltd.
Peter Ojala, Vice President of LEA Consulting Ltd.
Project Architect and Architect of Record: IBI Group Architects (Canada) Inc. Structural and Civil Engineering: LEA Consulting Ltd. PLEASE NOTE: TSA Members can join for free! Use the code in the TSA Bulletin to gain access to your free ticket! Not a member yet? You can join the TSA and get access to discounts and free member programming by registering online using this link.